Mon-Sat extended from Barking Garage to Becontree via Bennetts Castle Lane replacing withdrawn section of Route 238 which was diverted to Little Heath. Sunday Route extended from Barking Garage to Becontree via Becontree Avenue and renumbered 5B ..
Mon-Fri withdrawn between East Ham and Becontree and diverted at East Ham to "White Horse". Becontree section replaced by new Mon-Sat 33 Route. Mon-Fri withdrawn between Clerkenwell Green and Bloomsbury. Sunday introduced between Bloomsbury and Poplar with early journeys extended to East Ham. This partly replaced withdrawn 5B . Mon-Sat PR allocation re-introduced and Sun WH allocation re-introduced. Revised to operated between Bloomsbury and East Ham all day. Daily extended from Bloomsbury to Waterloo via Route 68. Mon-Sat reverted to Crew Operation. Daily extended from East Ham to Becontree Heath via withdrawn 23. PR allocation withdrawn. New Sunday BK and U allocation introduced at the expense of WH. Re-routed at Shoreditch via Route 78 to Aldgate instead of via Commercial Street. Sunday Route reverted to Crew Operation. Sunday BK allocation transferred to WH. WH vehicles changed from RM to T crew operated. Mon-Sat BK allocation re-introduced. Sat WH allocation introduced. U allocation withdrawn. Mon-Sat BK allocation replaced by reintroduced WH allocation. Mon-Sat withdrawn between Poplar and Old Street/Holborn (partly replaced by new D3) and introduced instead between Canning Town and Becontree Heath replacing withdrawn section of D5. Sunday Route between Canning Town and Old Street withdrawn after market closed. Sunday extension from Canning Town to Old Street withdrawn. 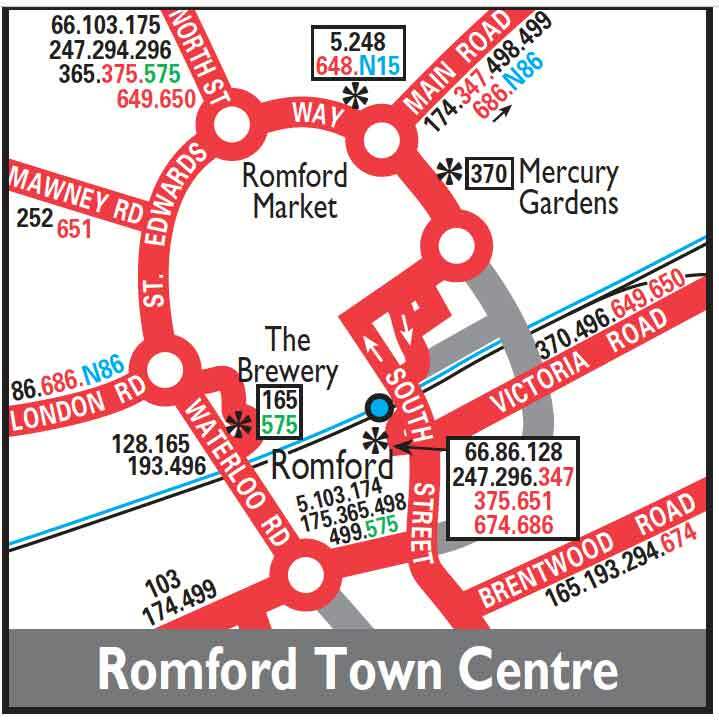 North Street Romford (NS) allocation withdrawn.